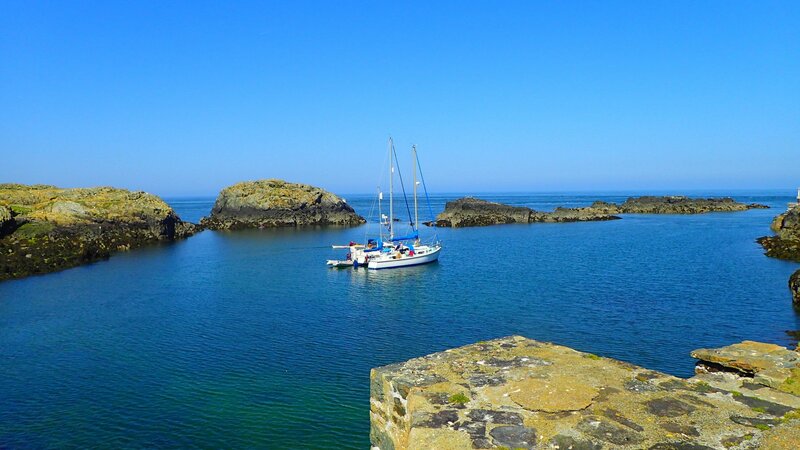 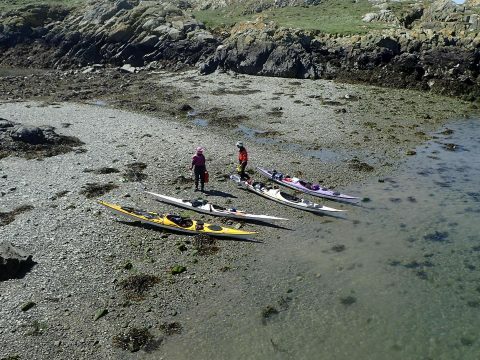 Meeting with PDCC at 9:00am it was soon settled with the weather forecast and tides, a trip out to the Skerries was most definitely on. 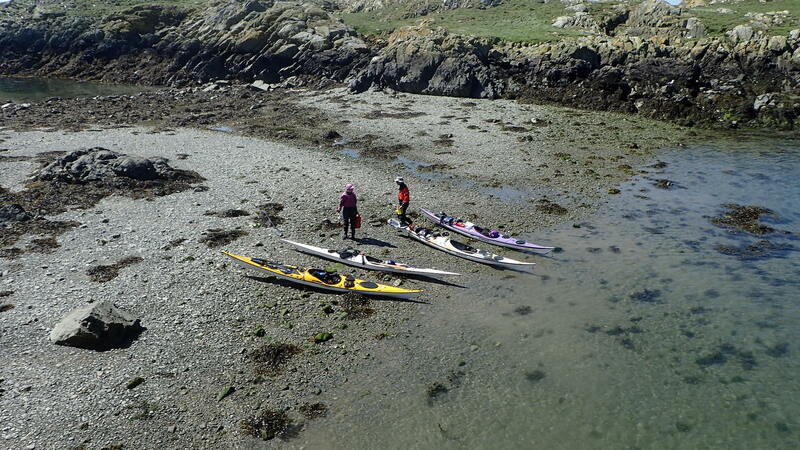 So off we went to meet again in the car park at Camaes Bay. 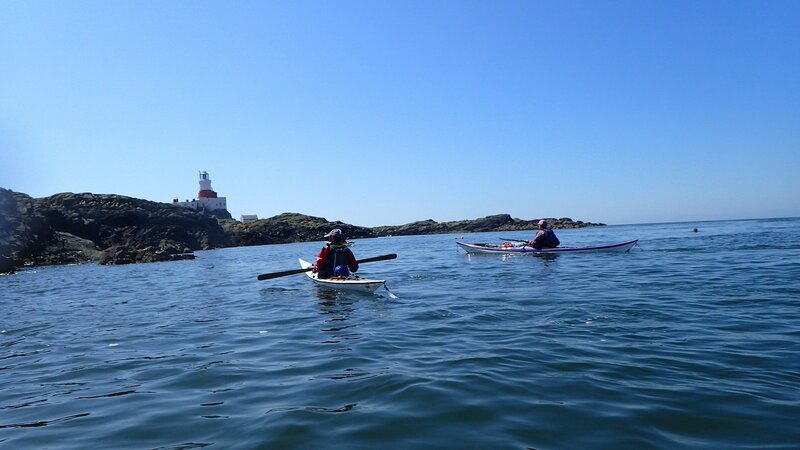 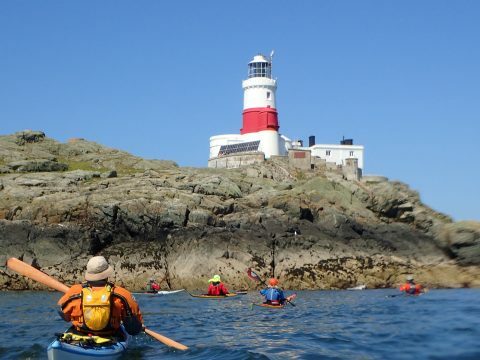 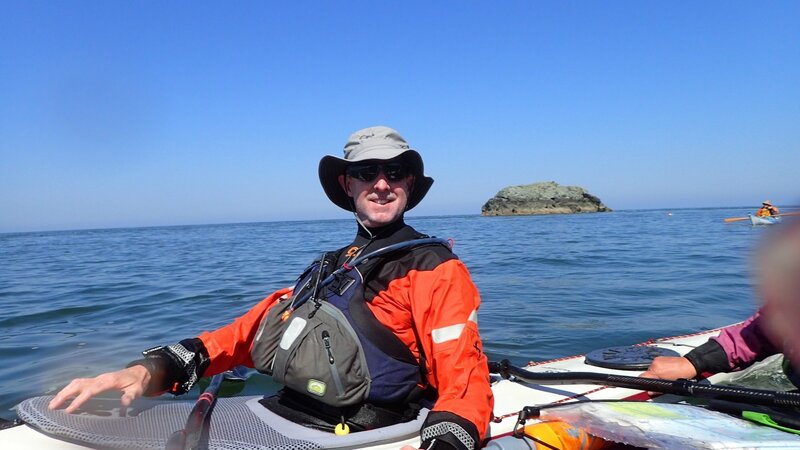 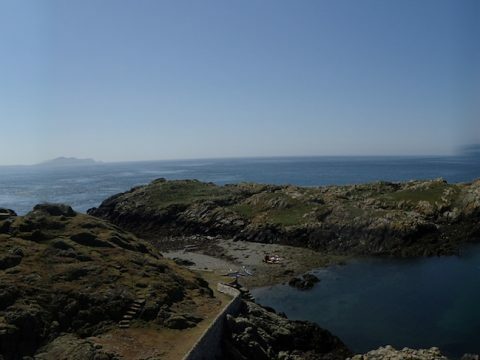 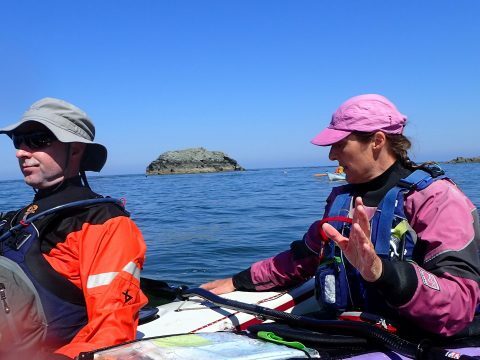 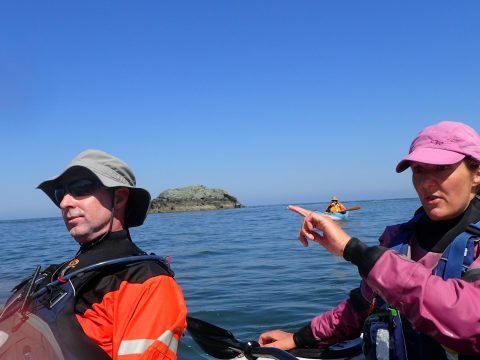 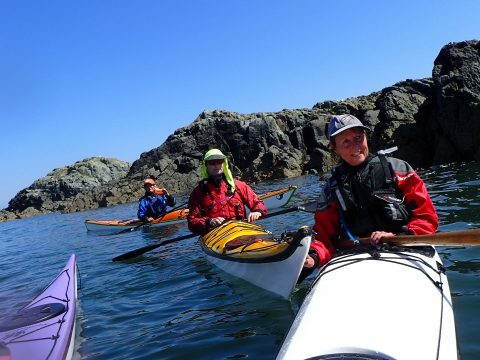 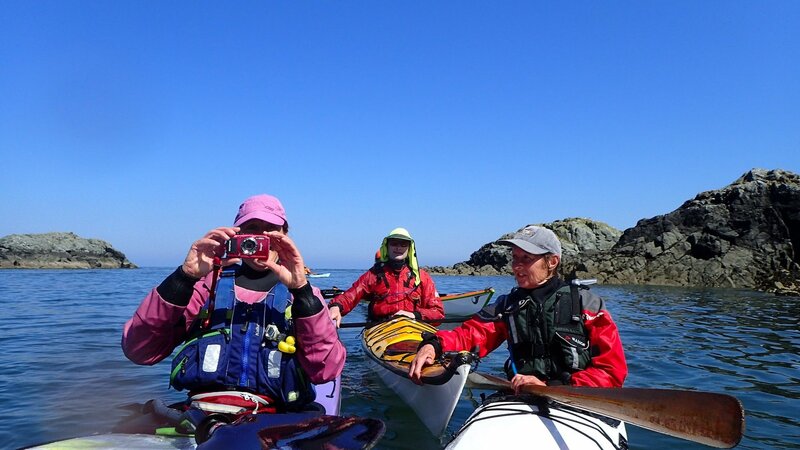 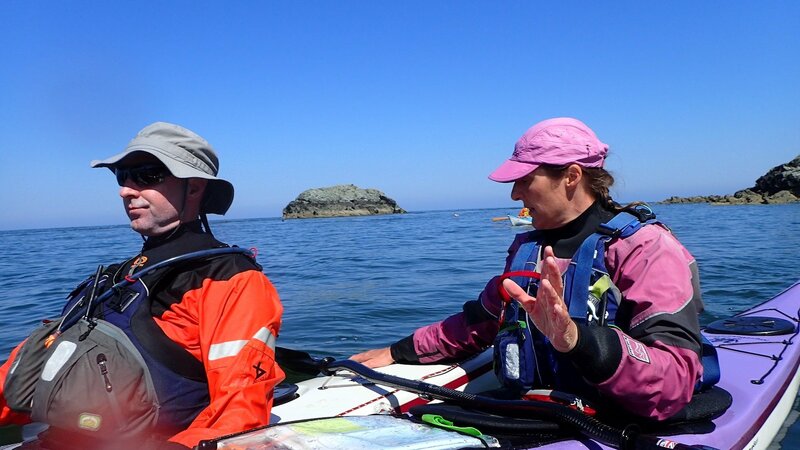 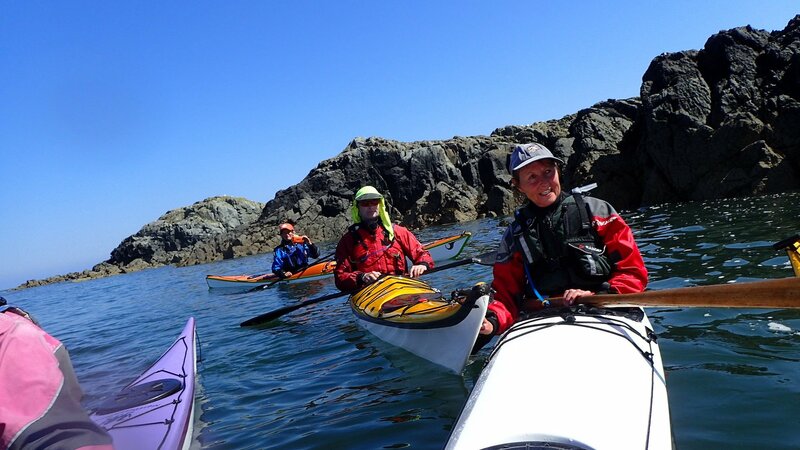 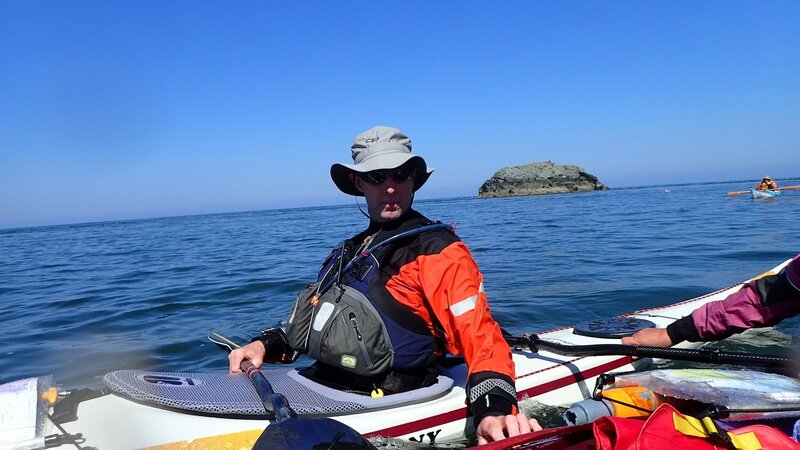 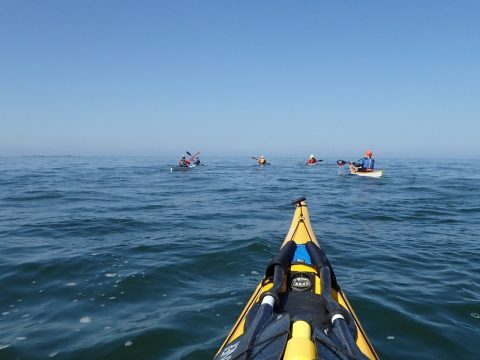 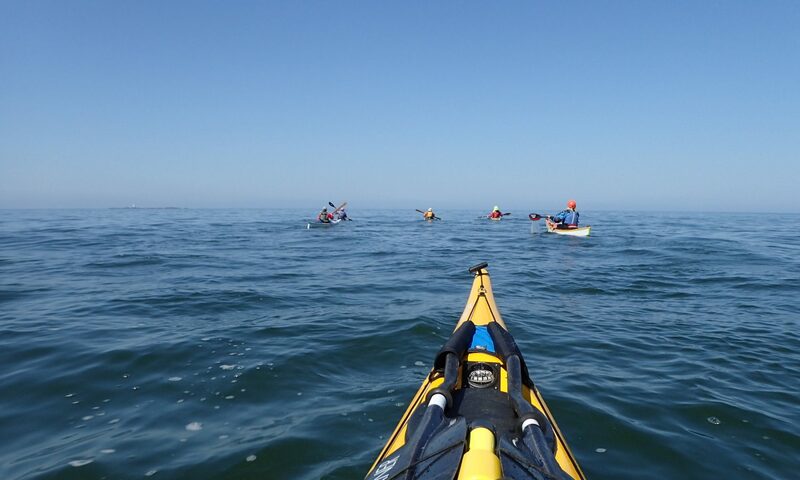 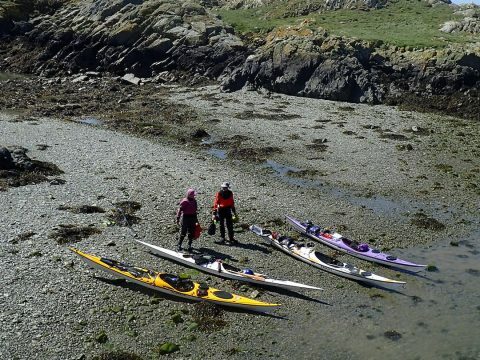 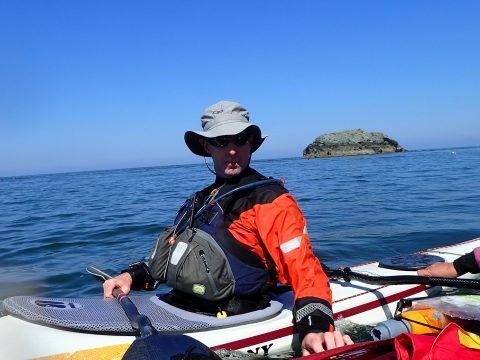 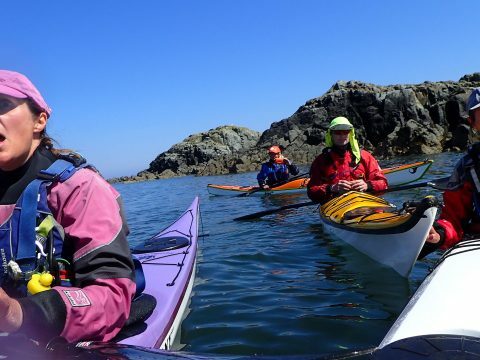 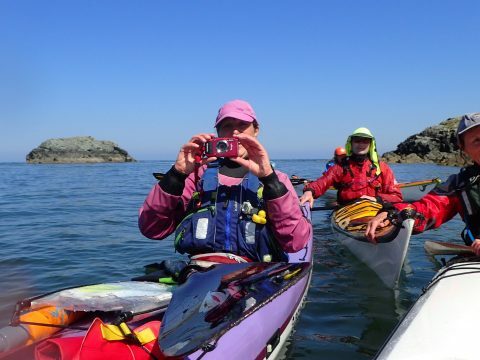 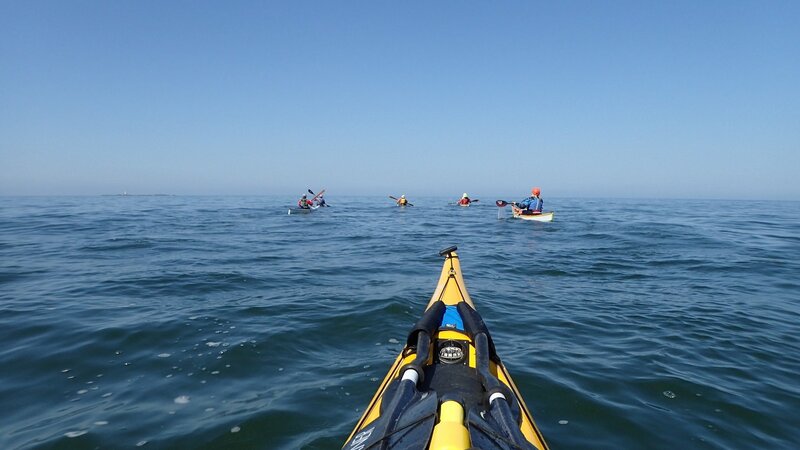 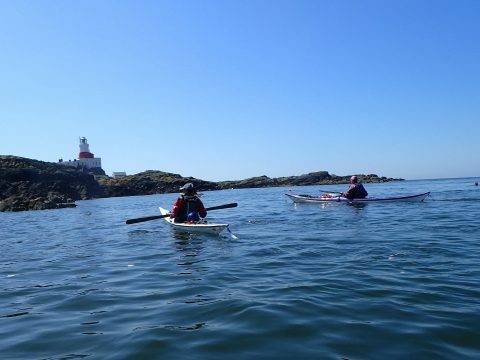 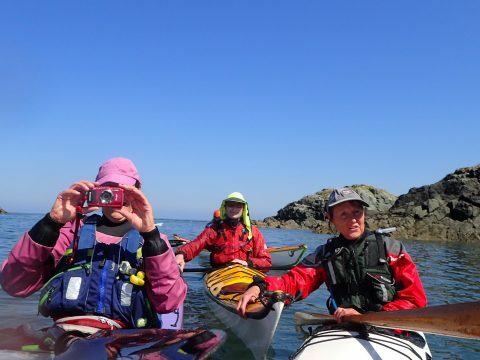 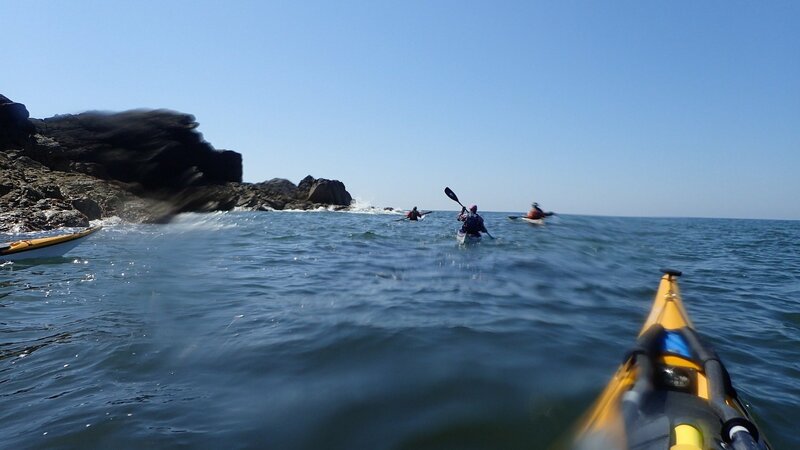 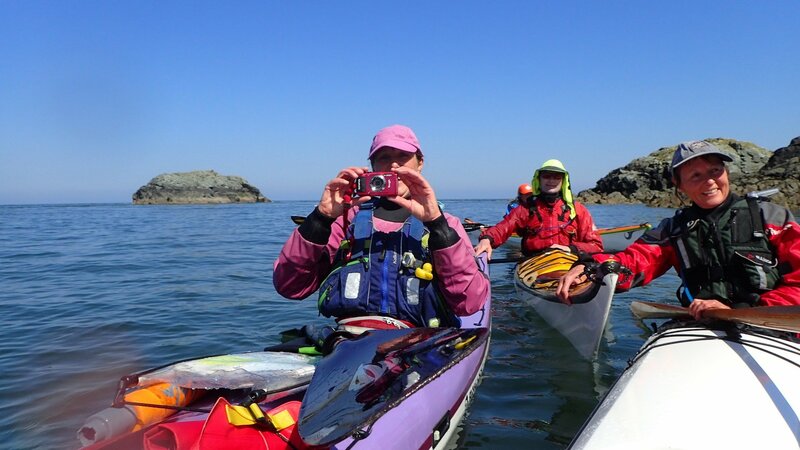 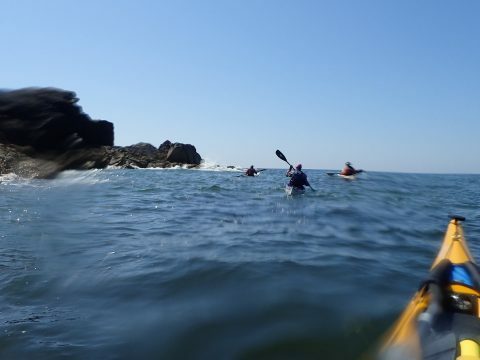 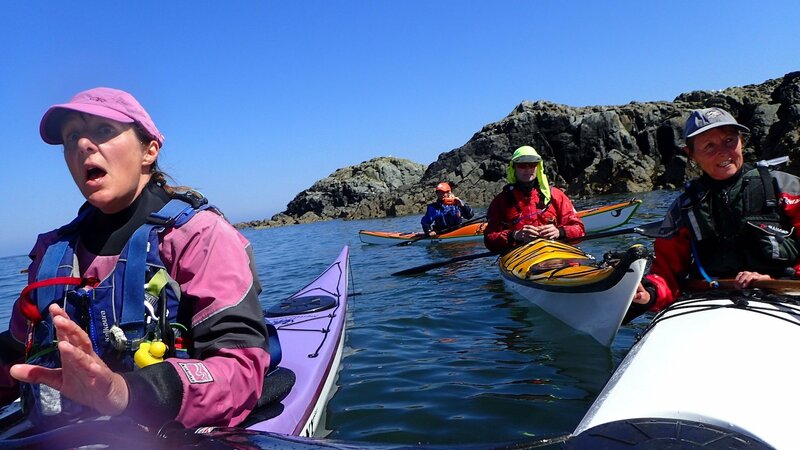 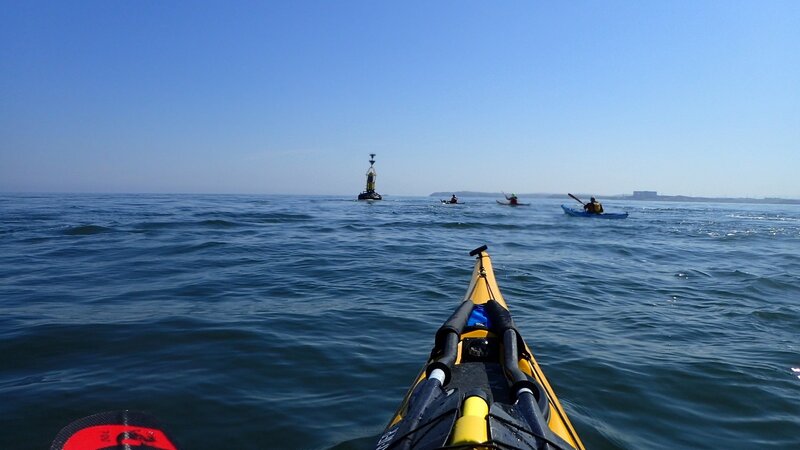 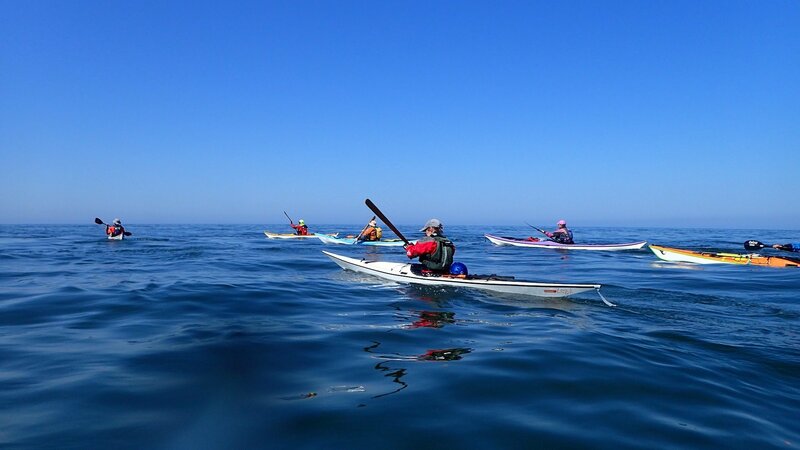 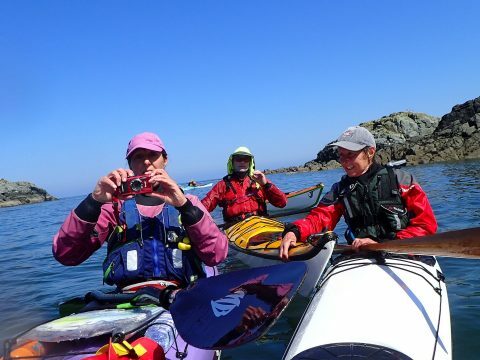 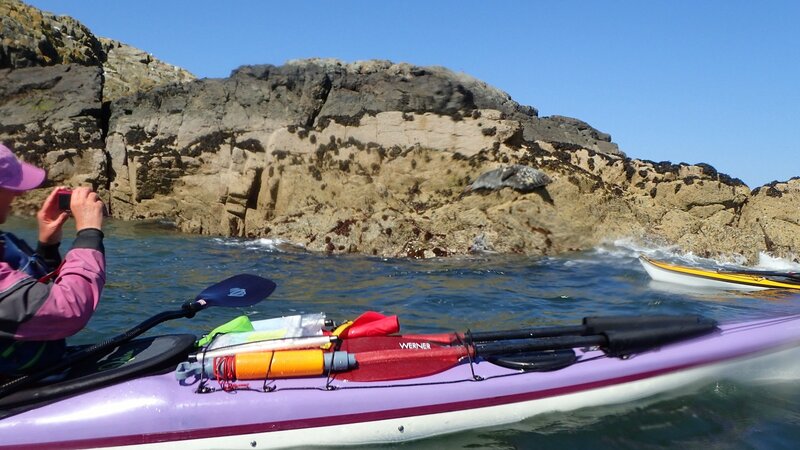 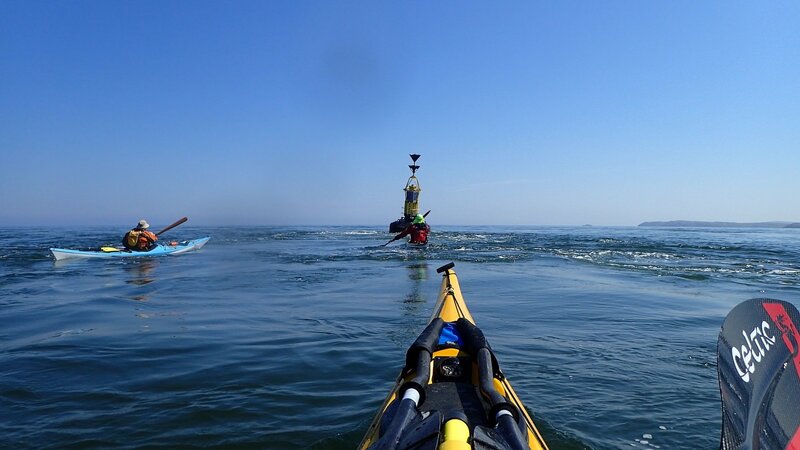 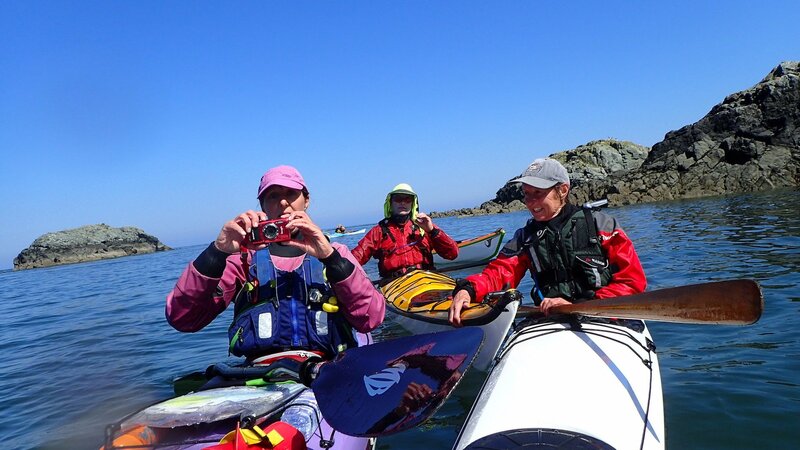 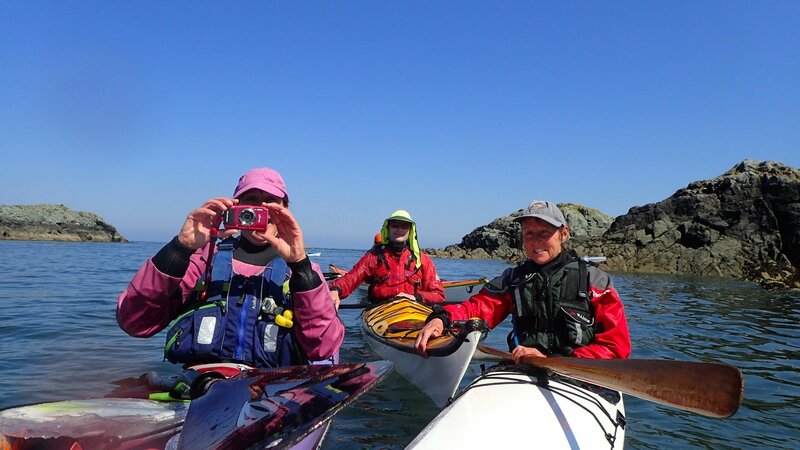 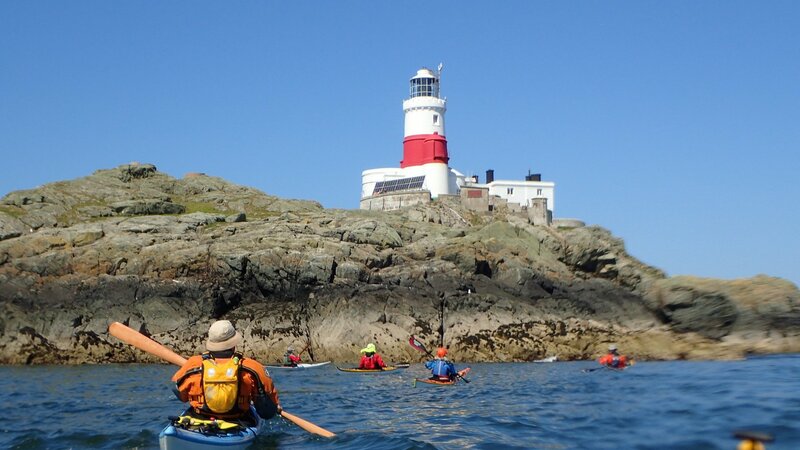 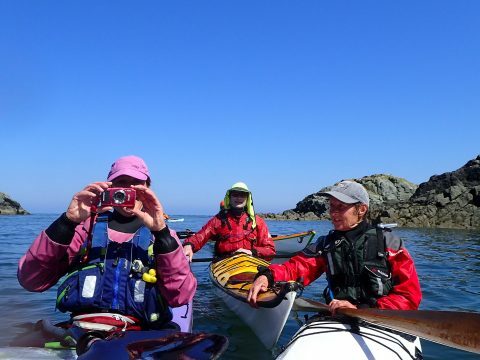 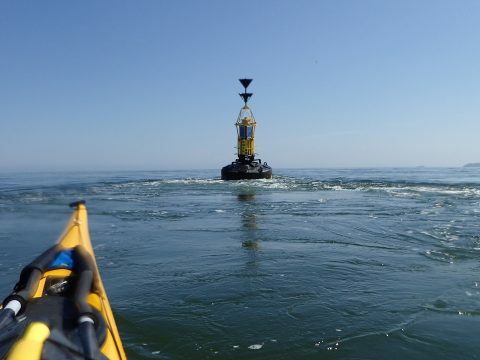 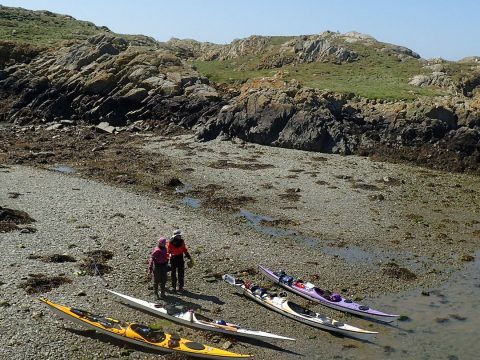 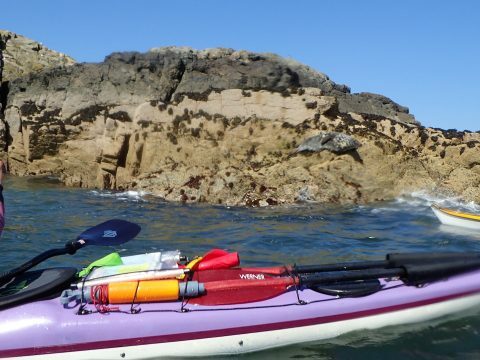 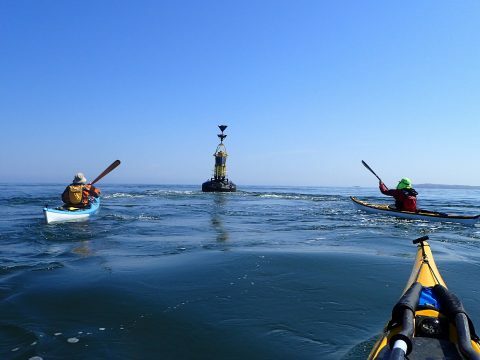 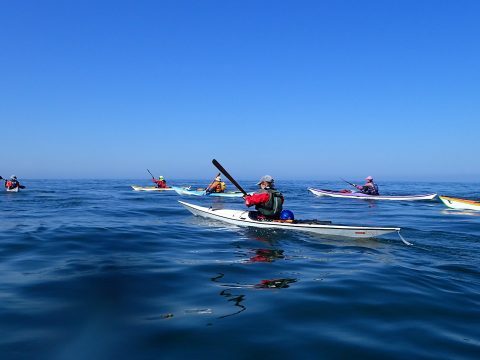 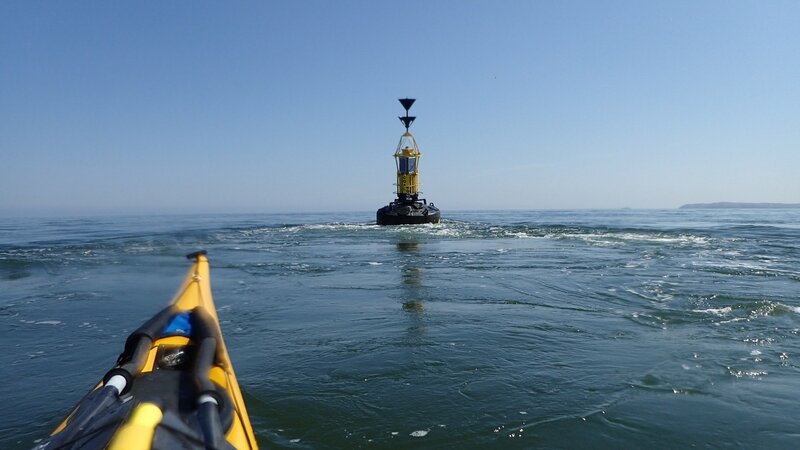 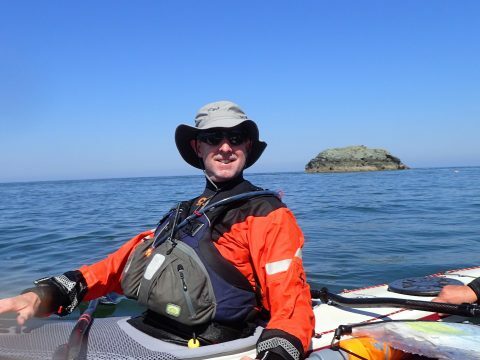 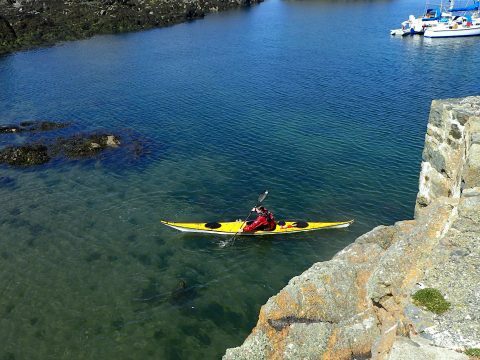 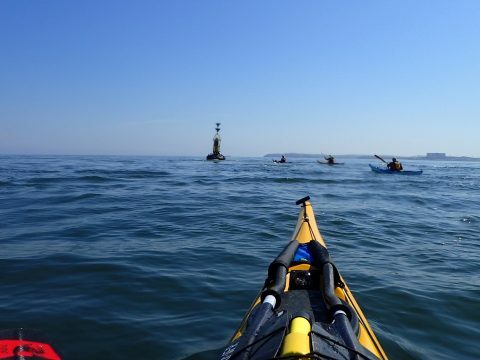 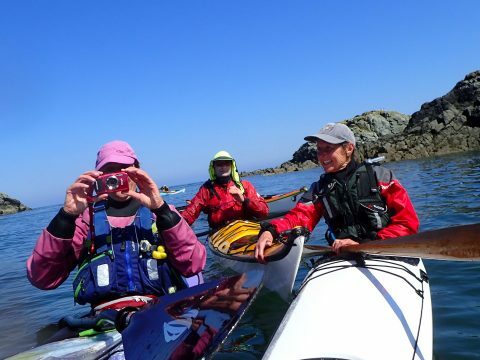 It was only a couple of weeks ago Helen, Gordon and I paddled to the Skerries under James Stevenson‘s guidance (Adventure Elements) as part of our Five Star training. 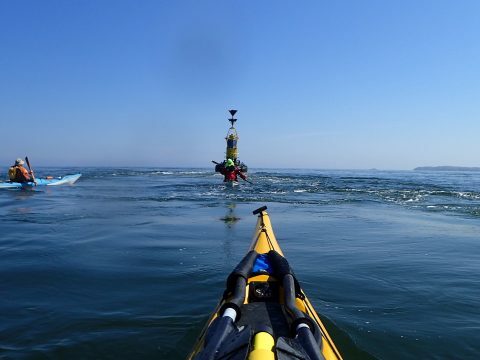 It was going to be interesting to see how the two GPS tracks compare at the end of the day. 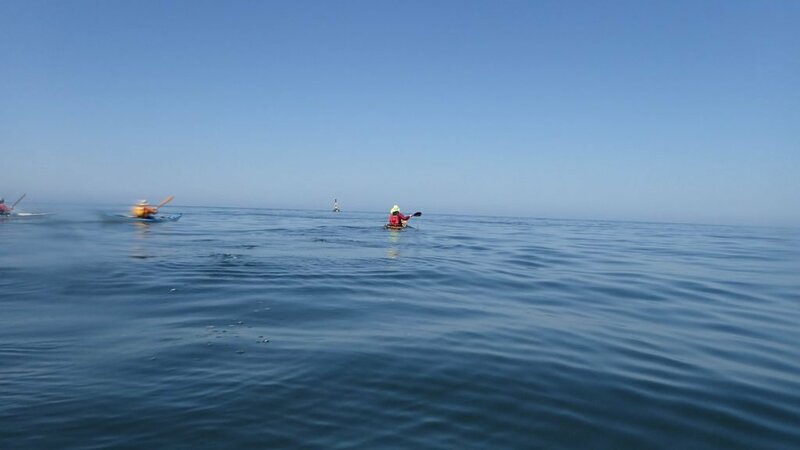 As we were setting off a little early we decided to paddle towards the power station before setting out to the Victoria Bank Cardinal. 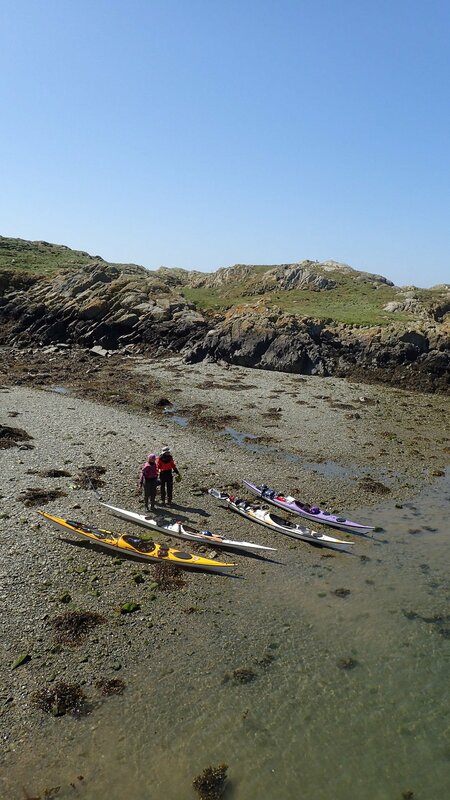 This also avoided the tide around Harry Furlongs which was a slight concern for some of the group. 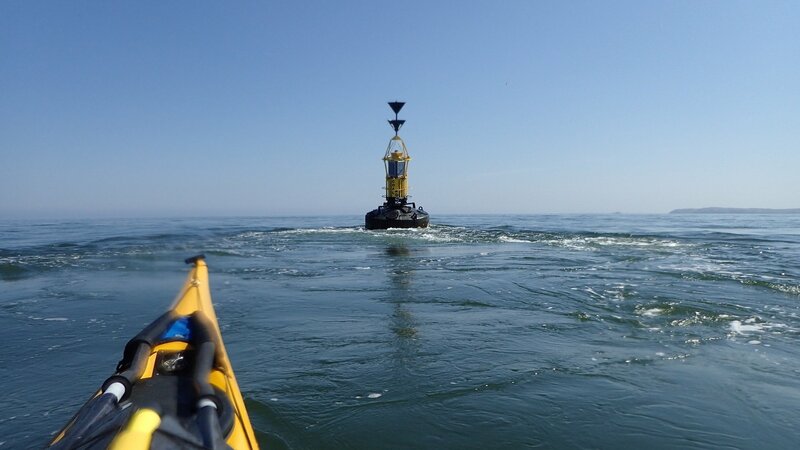 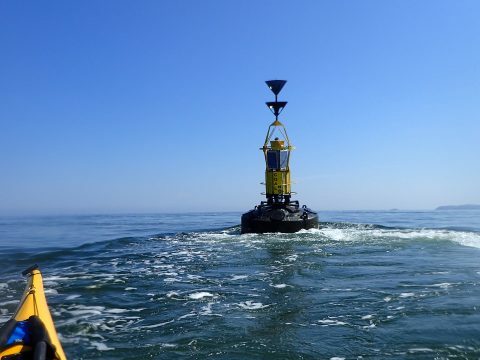 Setting out from the coast in a northerly direction the sea seemed like it was not moving, yet we were already moving in a north westerly direction and easily making 5kts. 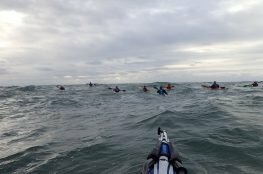 It really didn’t feel like we were moving at all! 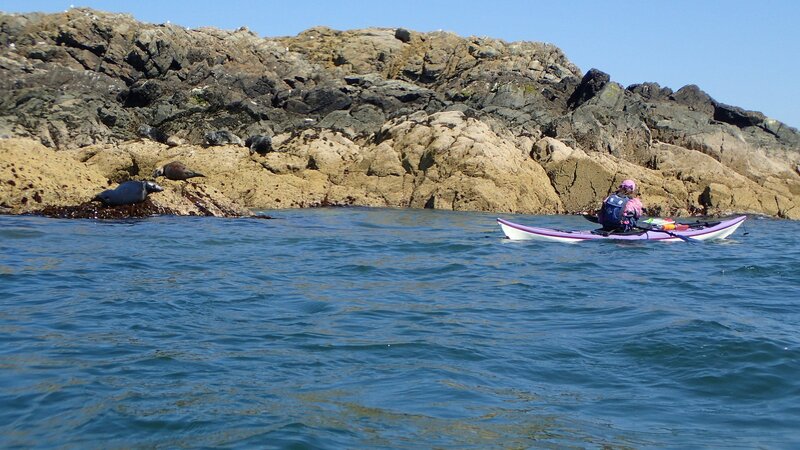 As we neared Coal Rock cardinal I could see Ethel Rock Cardinal moving rapidly on the horizon. 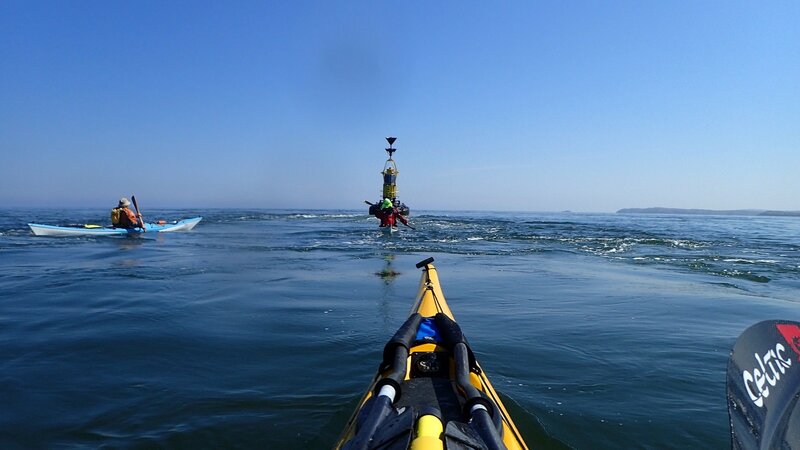 For a minute I actually thought it had come loose from its moorings! 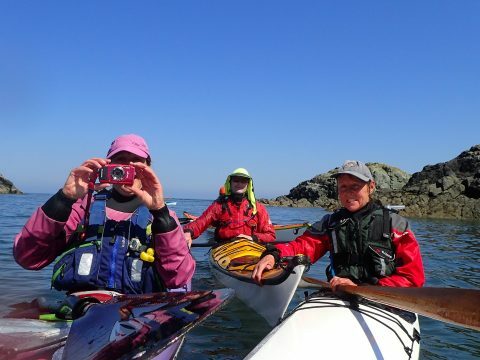 But of course it wasn’t Ethel Cardinal moving, it was our group, moving at around 7 kts!! 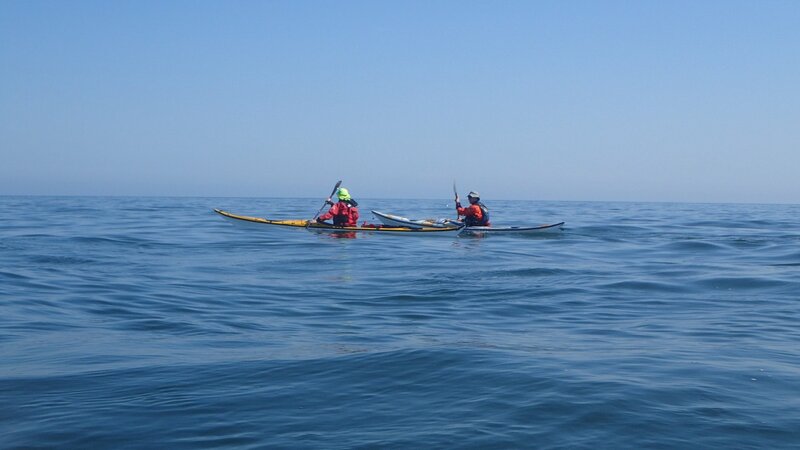 Pulling into the eddy behind Coal Rock we took a breather. 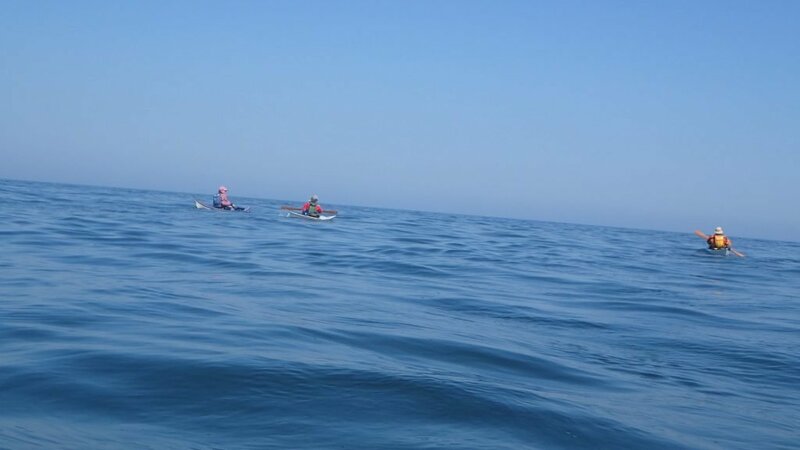 But not for long, because as soon as you stopped paddling you we soon dropping back in the current. 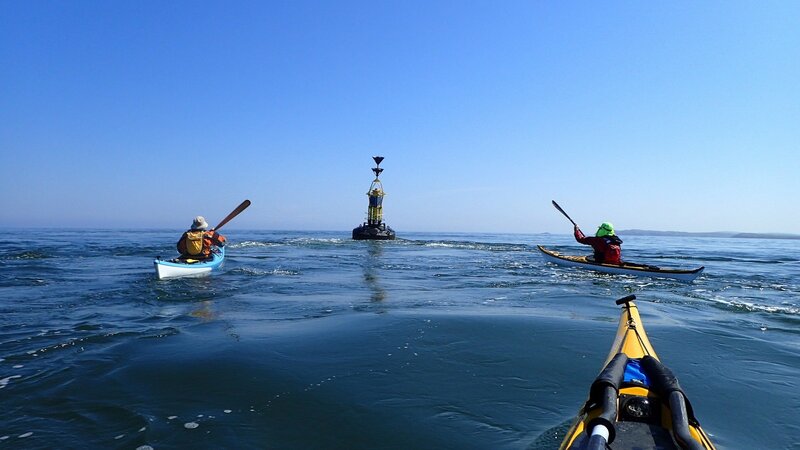 So it was off and out of the eddy and towards Ethel Cardinal, that now had thankfully stopped moving on the horizon. 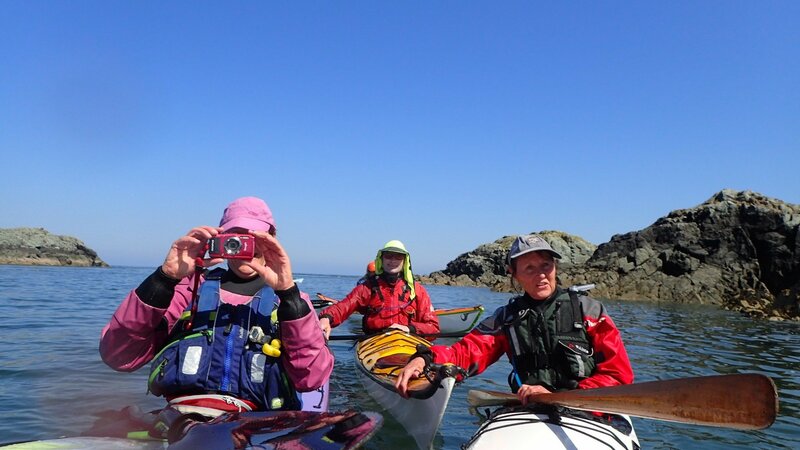 Keeping an eye on our transits we were about half way between Ethel and Coal Rock Cardinals before making our turn towards the Skerries. 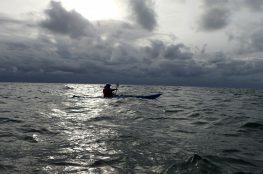 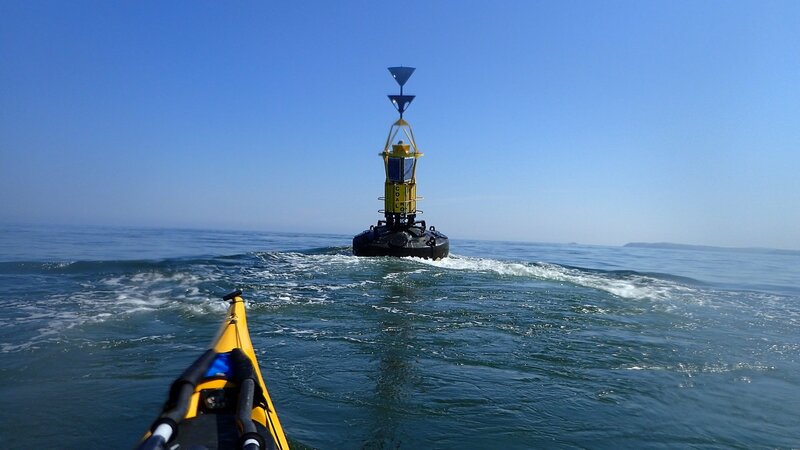 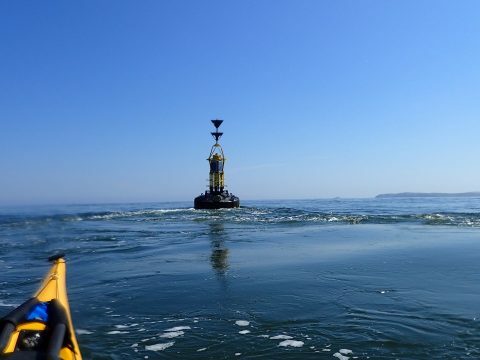 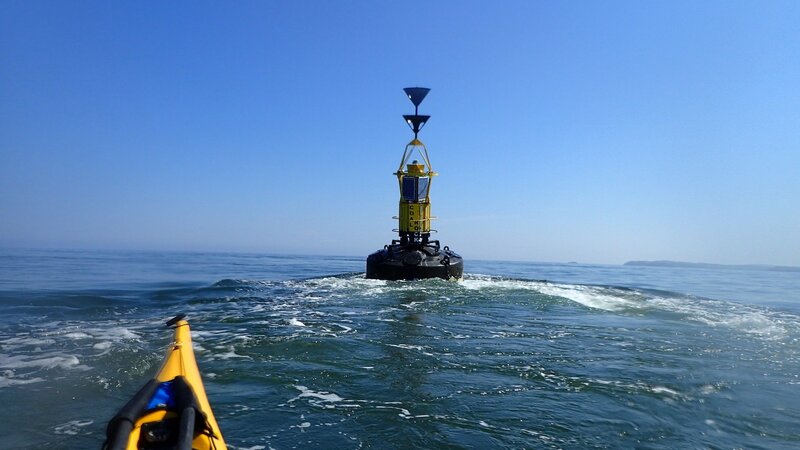 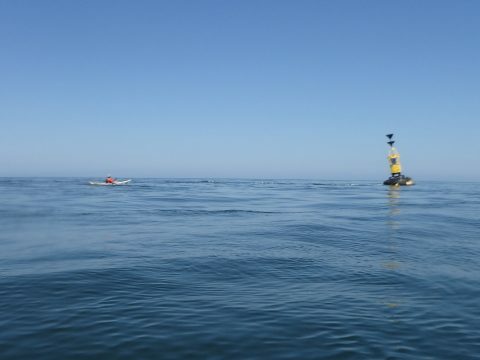 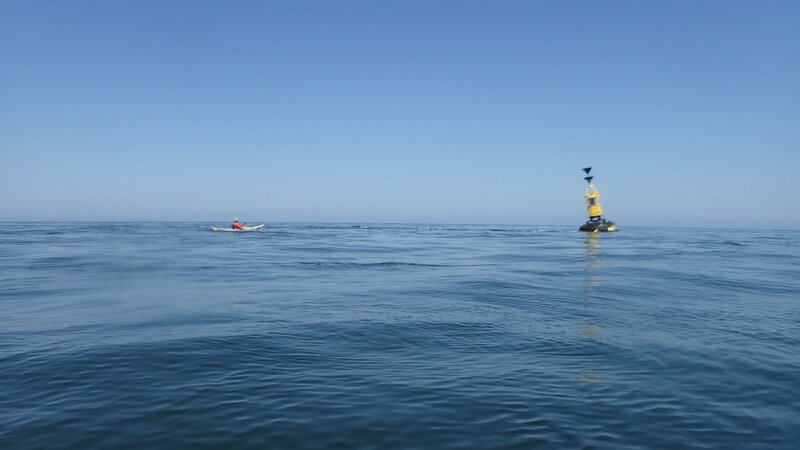 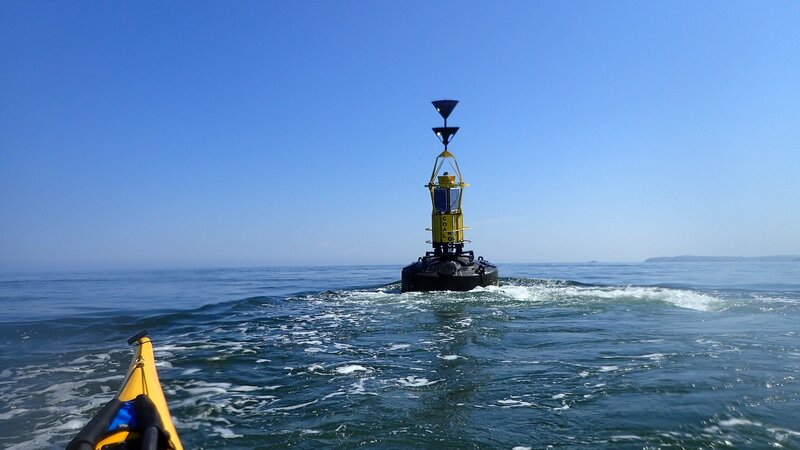 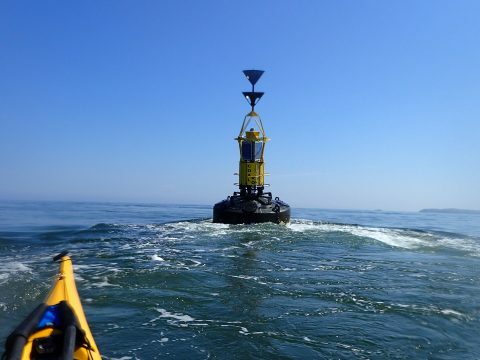 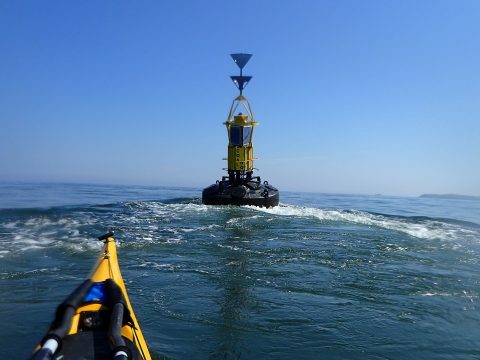 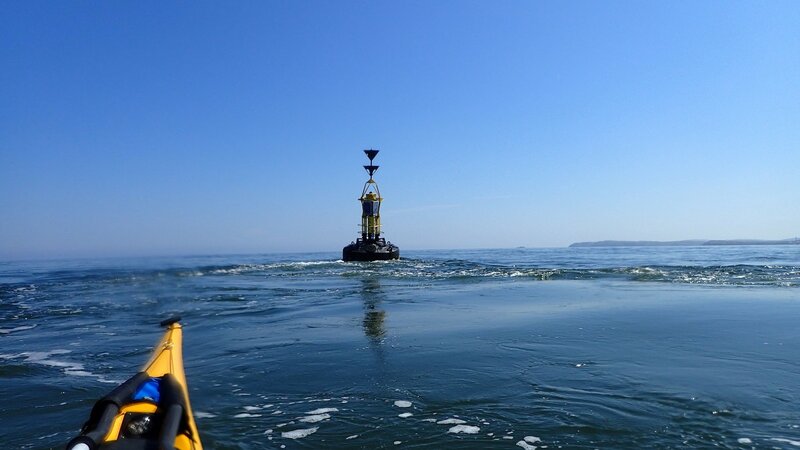 We were now paddling with the flow doing 7kts bearing down on our target. 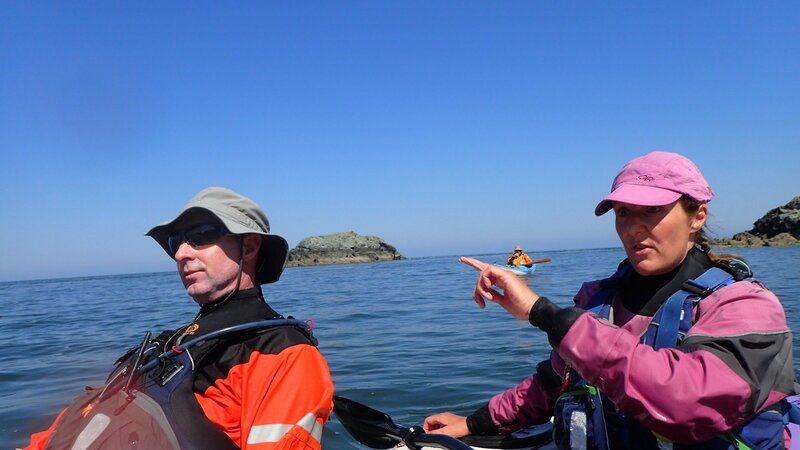 We hit the target bang on! 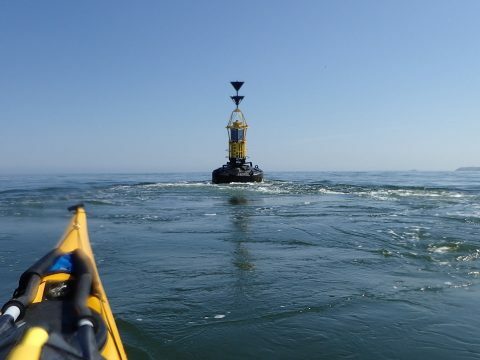 Though the small tide race and into the shelter of the harbour. 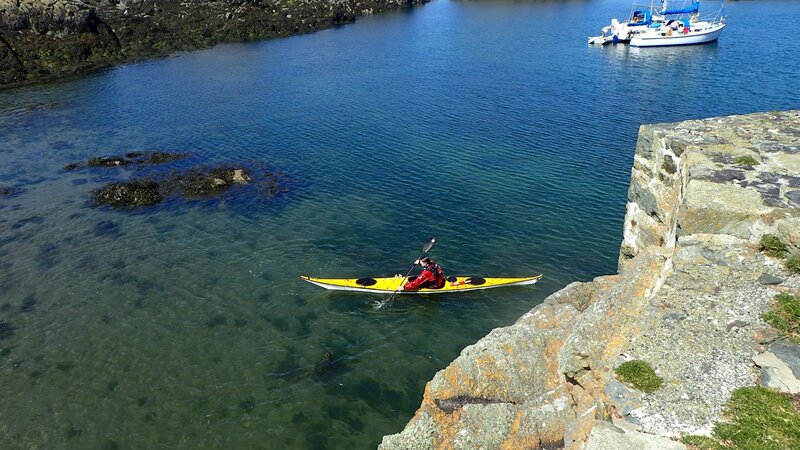 The Seals all around us poking their heads out of the water to see who had arrived. 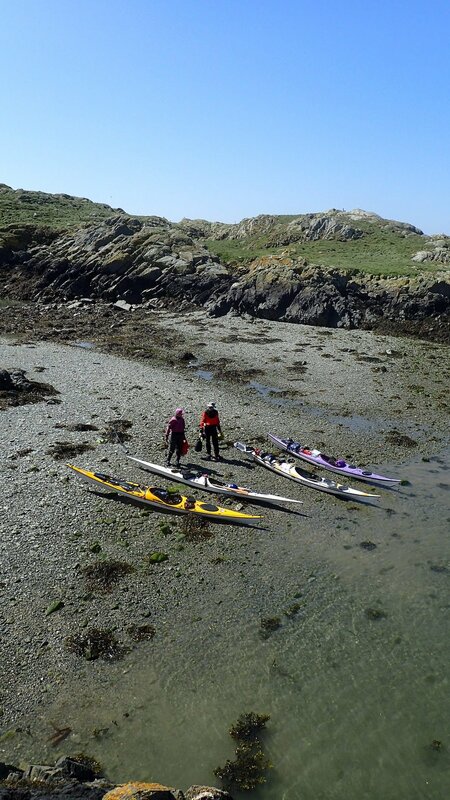 After lunch, just before the tide turned we set off around the island and then started the ferry guide back to Carmel Head. 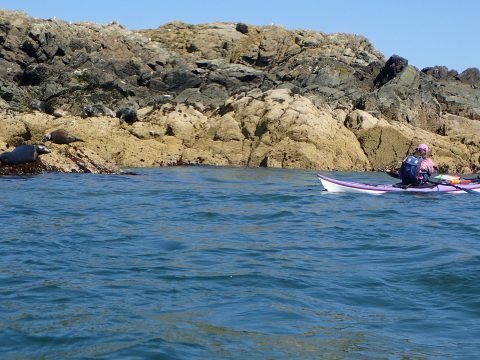 The tide was still ebbing at this point but by the time we were near Carmel the tide had started to flood. 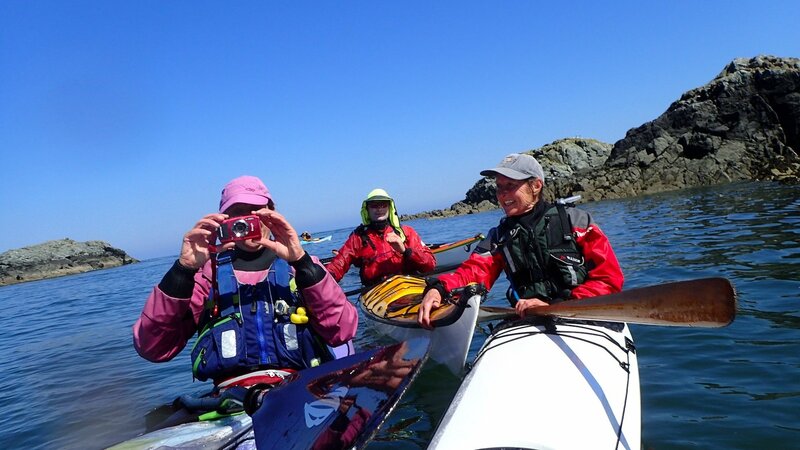 After a quick stop for a breather at Porth Yr Ebol we were soon back on the water heading back towards Cemlyn bay at an ever increasing pace. 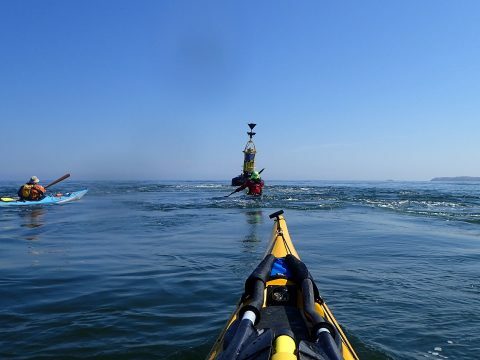 Above is the GPS comparisons. 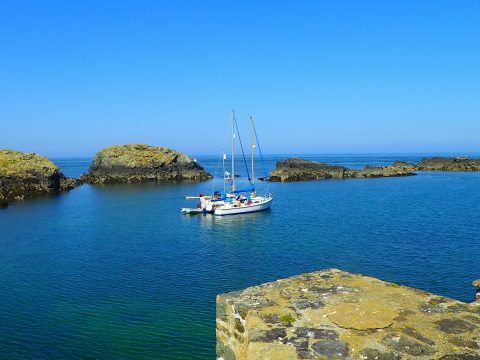 Not at all bad!! 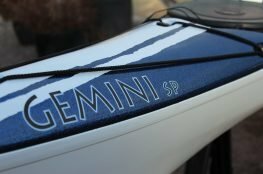 As always, best paddle ever!